Last week I was one of the lucky few to be invited to the annual Tast del Decenni in the Priorat comarca. Essentially what this is, is a taste of the wines from a decade ago from both the DOQ Priorat as well as starting in 2012, DO Montsant. There were 24 wines as well as one guest to be tasted and this being 2014, all of the wines were from the 2004 vintage. The goal was simply to see how these wines aged over the last 10 years and evaluate their evolution via a system devised by Vitec. It’s a fascination journey as these wines (of both DOs, not just Priorat) have the potential for long aging. Many of the aged wines aren’t even put on the market until three or four years after they’re produced and so this tasting, 10 years later presents a small window for those of us in attendance to witness this. It’s important to note several things about the tasting. First of all, it’s completely blind so you don’t know what it is you’re tasting. Secondly, it’s intense. With how I normally taste, I would have spent 30 minutes with each of these bottles initially and then returned two hours later to see how the wine had decanted. As it was, we went through all of them in about two hours. This merits only a quick swish and spit. 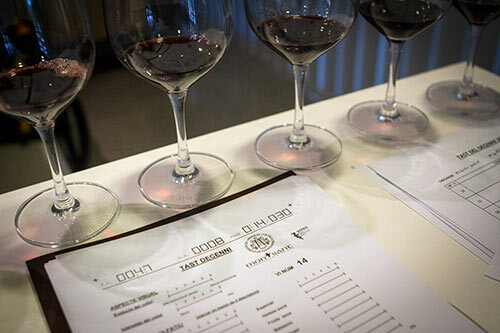 Given that I typically write drinking notes, not tasting notes, I feel it may have sold some of the wines short, but so it goes–there were many more tastings to attend and these few hours for this tasting flew by. Following were the wines and my quickly jotted down scores of + doing well, o neither bad nor exciting, or – a wine passed its prime and unraveling. Note that these are all in order of tasting. This was a thoroughly enjoyable selection and I feel honored for having been a part of it as, having tasted both of these regions for the Priorat & Montsant books I’m very familiar with them, but not in how they age. The most interesting aspect is that after 10 years, the minerality for which DOQ Priorat is so well-known has all but disappeared. And, more to the point, discerning between DOQ Priorat and DO Montsant is quite difficult which was confirmed by a long term DOQ Priorat winemaker who confided in me afterwards that he tried to guess, but got many wrong. Age it seems, is the great equalizer. By and away, the top of the group was the Mas d’en Gil. One of the fellows sitting at the head of the tasting panel, Joan Gómez agreed as well as the enolog of Álvaro Palacios sitting next to me. That bottle easily has another three years of optimal drinkability in it and maybe even five. When I first tasted them for the book, I didn’t appreciate them as much as I should have as their trajectory is for an incredibly long live. It was a damned shame the Joan Simó had TCA as I’ve tasted several older vintages of Les Eres and Gerard (with the advisement of Josep Àngel of Gran Clos, another great wine) is making wonderful vintages in the village of Porrera. Despite the fact it was blatantly flawed, tasting it some 30 minutes later, it had actually opened up a good deal and was showing decently. Both the Clos Figueras and Mas Doix weren’t surprises. They make beautiful wines in those wineries and they know it, but they’re entitled to this as I will readily drink anything that emerges from their cellars. Very different wines from very different microclimates, but still excellent. L’Esparver was a surprise as I tasted one of their recent vintages and this top-end wine from Ètim really did nothing for me. Obviously, 10 years ago was a different era and I don’t know if their enolog changed or it was simply due to a different vintage but to me, this wine continued to stand up although my fellow tasters seemed to feel quite differently. The Anima Negre was definitely the oddball in the group. The first taste of it was just all leather and tobacco with no fruit. Still, a decent surprise to see that the wine is viable 10 years later given that I’ve had a great jumble of emotions when tasting the wines of Mallorca. There were some wines that were simply falling apart like the Vall Llach. I mentioned this to the co-owner and current enolog, Albert who is a friend and he admitted that he wasn’t on the enology team 10 years ago. I seriously don’t think that any of the new vintages would show this low as they’re potent and crafted for years of aging–not to mention delicious. In closing, a fantastic tasting. I hope that the powers that be will see fit to invite me back next year as 2005 was a very good growing season and I would absolutely love to partake of this fascinating exercise again.